Shown are 3 identical fireplugs, both front and reverse views. I am trying to identify the manufacturer of these units. They do show the model NO 1002, same as the UNIVERSAL made pieces, but that is where the similarity stops. 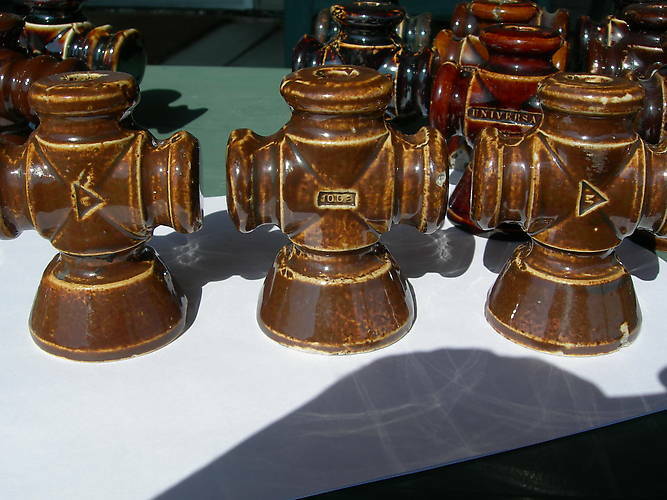 The glaze is different from all identified UNIVERSAL pieces, and the TRIANGLE logo on all three pieces has me wondering. Does anyone recognize the manufacturers mark? These 3 pieces are attributed to the Illinois Electric Porcelain Co., of Macomb, Il. The Macomb Porcelain Co. is a division of Illinois Electric Porcelain. I am always looking to add to my collection of fireplugs.